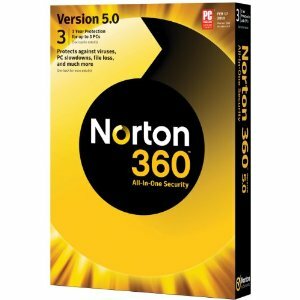 Norton 360 5.0 gives your computer complete protection. You get all the features of Norton Internet Security plus some added features such as an automatic online backup with 2GB of backup. Norton 360 impressed me right away by how easy and fast it was to install. I actually let it sit on my desk for 2 days before installing it just because I dread the long installation process most programs have and the computer lag that normally comes with it. With Norton 360 there was no need to worry. It literally took me less than 5 minutes to install and start my first scan. Since I know that installation can also be system based, I will also tell you that this is the fastest any program has ever installed on my computer. I was also impressed by how many different features Norton 360 has. I have previously used other Norton programs, but never the 360. I instantly started a quick computer scan and within a minute and a half I had 5 things discovered and fixed on my computer. I then proceeded to backup my files online using Norton. This is a really neat feature that other versions do not have. The backup feature took several hours, but it is worth it to know that my music, pictures and other files are protected if something happens. I continued to play around with Norton and tried all of the different features (often several at once). Everything other than the online backup only took a few minutes to do and worked great. Norton also told me which areas of my computer where protected and how to fix the one that was not. Norton 360 also automatically sets your computer to do updates when the computer is in down time. I love this because you won't have annoying updates pop up in the middle of doing something important. I really hate when you are trying to type a paper (or review!) and Windows or Java or some other program keeps popping up update notices, or worse, automatically shuts down your computer. I have been using Norton 360 for about 3 weeks now and I have had no problems with it. I surf the internet, use Photoshop and other programs and even download things quite often. Norton 360 is virtually invisible while protecting my computer. For me, that makes it the perfect virus protector. Disclaimer: I received the above product free of charge from Amazon in exchange for this review. I was not asked to write a positive review. All opinions here are 100% my own.